← What Does #Oklaed Mean to You? In the journey that is student centered learning, my week for the class recently ended. If you would like to see how this particular course is being organized, check this link. This past week I chose our readings and they were organized around makerspaces and gamification. The #makered movement and gamification are both gaining in popularity and schools around the world. One of the requirements for this particular course is to submit and start working on a research idea. My idea was gamifying a makerspace….My thoughts are below the articles we reviewed. Domínguez, A., Saenz-de-Navarrete, J., De-Marcos, L., Fernández-Sanz, L., Pagés, C., & Martínez-Herráiz, J. J. (2013). Gamifying learning experiences: Practical implications and outcomes. Computers & Education, 63, 380-392. Forest, C. R., Moore, R. A., Jariwala, A. S., FASSE, B. B., LINSEY, J., NEWSTETTER, W., … & QUINTERO, C. (2014). The Invention Studio: A University Maker Space and Culture. Advances in Engineering Education,4(2). 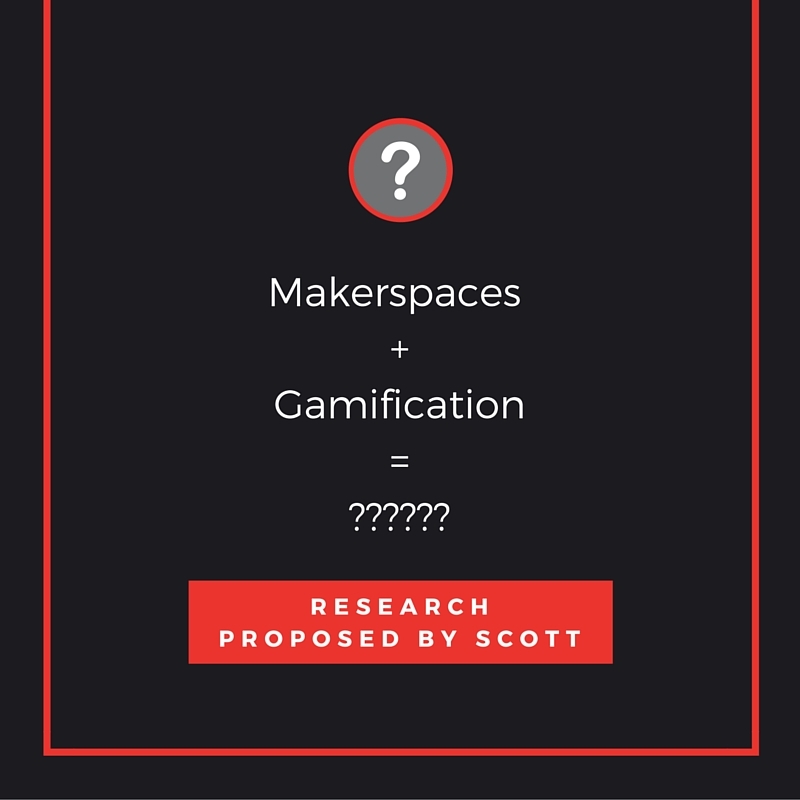 I have blogged several times over gamification, my classmates chose the higher ed makerspace article, so I am going with: The Philosophy of Educational Makerspaces part 1 by Kurti, Kurti, and Fleming. This article gives several different things to consider for creating a successful makerspace. One of the most powerful things that can come from makerspaces is the unique opportunity for students to craft a very personal learning experience, while at the same time working collaboratively through that same experience. The learning is constructed as the students make mistakes, learn from those mistakes, talk with others who have made similar mistakes, modify their project, and repeat the process. If you think that students can’t figure something out on their own, or through using their peers, I invite you to watch this TED Talk by Sugata Mitra. It will challenge your beliefs. When developing your makerspace, the space needs to have a certain “feel.” One that encourages people to explore, be curious, make mistakes, accidentally break stuff, one where failure is forward. Post signs around the space encouraging failure. Leave the left over debris of projects gone wrong. Make sure the adult in charge is supportive and encouraging. Sometimes things break, use this as a learning opportunity. Each person that uses the makerspace brings with them a unique view of a problem. Celebrate that uniqueness! When a student works through a problem by using a different view or thinking outside the box, celebrate them! When a student is struggling with a particular issue, refer them to a student who navigated a similar issue successfully. Ultimately your makerspace should inspire deeper learning and should have a foundation of student ownership. The teachers do not necessarily need to be an expert in all of the areas inside a makerspace – but they should be ready to support student learning.